Family members of victims of Wouter Basson have expressed relief that the apartheid-era doctor has been found guilty after a six-year trial. 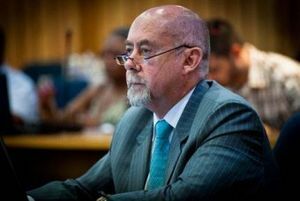 Wouter Basson was found guilty on Wednesday of unprofessional conduct for acting unethically as a medical doctor during his time as the leader of the apartheid-era chemical and biological programme Project Coast and later Delta G in the 1980s. Basson was not present at the hearing as he had an emergency with one of his patients in Cape Town, said his legal team. However, the family members of his victims attended the judgment hearing. Lizzie Sofolo’s husband was abducted, drugged, tortured and killed in the late 1980s – with the use of drugs made by Basson. “Today the truth has prevailed, it is clear that he used his knowledge as a doctor to kill innocent people,” she said. Maria Ntuli’s son, Jeremiah, was one of 10 Mamelodi youths who left home to join the ANC’s armed wing, Umkhonto weSizwe, in 1987. In 1996 the Truth and Reconciliation Commission heard that the group was drugged and put into a Kombi that was crashed into a tree and exploded. “We just want this case to be over with now. It has been dragging on for years now, why doesn’t it just end?” said Ntuli. The Health Professions Council of South Africa‘s (HPCSA) inquiry into Basson’s conduct during apartheid has been on-going for six years now. The judgment was made by the HPCSA’s professional conduct committee chairperson Jannie Hugo in Pretoria. Basson, who is now a private cardiologist, was found guilty of coordinating the production of and stockpiling of mandrax, ecstasy and tear gas “on a major scale”. During this time, Basson provided “disorientating substances used for over border kidnapping” and supplied cyanide capsules to operational officers to use to commit suicide in case they were caught. “The committee rejects that ethics have to be interpreted in the context of the time, medical ethics are the same during peace and war,” said Hugo. HPCSA registrar and chief executive Buyiswa Mjamba-Matshoba said she was unable to comment on what the appropriate sentence would be for Basson except that “the sentence will be in line with the charges”. Mjamba-Matshoba said that she was “very happy that justice has been done and that ethics have been upheld in this profession”. “Dr Basson kept on saying he acted as a soldier, but during this time he kept the registration of the HPCSA and that binds him to the council’s values,” she said. His sentencing will take place in February 2014. 1. The alleged unprofessional conduct happened within the context of a specific war and conflict situation. 2. He was under military instruction and supported by senior doctors. 3. He acted as a soldier and not a doctor. 4. He acted as a military doctor and ethics for military doctors are different. 5. The people who received the substances were not his patients, meaning that there was no doctor-patient relationship. 6. He was a young doctor and could not be held responsible for his actions. 7. He was not aware of the codes and conventions that forbade chemical weapons and the use of medicine for non-therapeutic purposes. 8. The medical ethics in 1980 were different from the ethics today. 9. The chemical substances (made for use in cross-border kidnappings) were specifically designed to be non-lethal and to protect life. 1. That medical ethics are very important in times of war and conflict. Medical doctors have a unique position in society which impels them to stay true to ethical values of the profession. The committee rejected the contention that this factor should be considered in the context of whether the conduct of the respondent was unethical. 2. The committee accepted the fact that the respondent acted on instructions of not only military commanders, but senior doctors. However, the committee’s view was that a medical doctor is responsible as an individual for his/her actions. Medical ethics require independence of thinking by each medical doctor. A doctor cannot simply rely on a military order to escape the consequences of his actions. NEED OF OUR EMERGENCY ASSISTANCE!